Where are the Circuit City shoppers? Today, Circuit City formally announced bankruptcy restructuring under Chapter 11. In this heaviest quarter for year-end consumer electronics holiday purchases, any change by a major retailer sets off a billard-ball type effect with competitors. As they ready their competitive responses, it’s most important to keep the eye on the customers. As part of the forthcoming Consumer Electronics Outlets Profile Report, MetaFacts has found several very interesting tidbits in our consumer research. Where else do Circuit City shoppers regularly shop and buy? We asked 8,016 online households about their shopping behavior at 26 major retail and online outlets. First, Circuit City shoppers are active shoppers – very active. 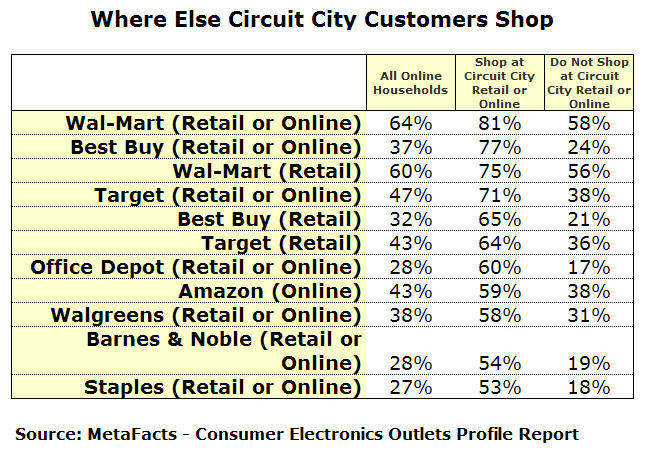 On average, Circuit City shoppers shop at nearly three times as many outlets as online households that don’t shop at Circuit City. Regularly shopping and buying at 12.2 outlets means there is a lot of competition for these active buyers, and buyers already know the way elsewhere. For more information about the forthcoming Consumer Electronics Outlets Profile Report, or about Technology User Profile Reports, please contact MetaFacts.